If you’re craving the rush of cold air and adrenaline on some of the most exciting ski slopes in NC, get ready! We’ve compiled a list of some of the best places to go skiing in Western NC. From Asheville to Lake Lure and Tryon, Western NC is a great place for outdoor adventure. Check out some of our favorite ski spots below. Have a spot you’d like to recommend? Please reach out to us! But, for now, here are the top 3 places to go skiing in Western NC. As the highest town in Eastern America, Beech Mountain is a perfect winter vacation spot along the Blue Ridge Mountains. With over 90 acres of terrain for skiing, 15 slopes, and a picturesque mountain view, Beech Mountain offers an unparalleled mountain adventure. 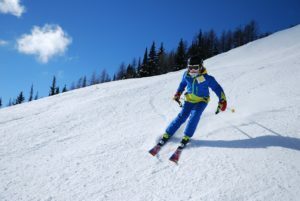 They also host special events throughout the year, such as a beer festival and themed ski weekends, as well as live music throughout the season. 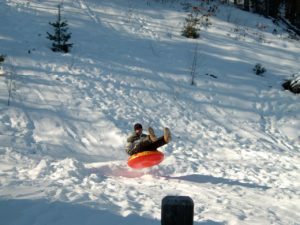 Only 40-minutes from Asheville, the Wolf Ridge Ski Resort is a local favorite for its winter skiing, snowboarding, and tubing. As part of the Blue Ridge stretch of the Appalachian Mountains, the Wolf Ridge Ski Resort is one one of the highest spots in the country. The resort recently expanded to offer an additional 15-acres of slopes, a new lift, new terrain, and so much more. From beginners to advanced skiers and snowboarders, enjoy playing on more than 70 acres of ski terrain. Though a little farther north than the Wolf Ridge Resort, Sugar Mountain offers skiing, snowboarding, ice skating, tubing, and so much more. Not so into skiing and snowboarding? Try tubing! This fun alternative to skiing involves sliding down the snowy slopes in a large water tube. Consider moving to any of the exciting communities of Western North Carolina. From Asheville to Saluda , these communities are brimming with friendly folks, mountain charm, and fun things to do. Explore Western NC communities and search homes for sale here. If you ever have any questions about life in Western North Carolina, Lake Lure, or Tryon, please give us a call at (828) 365-8444. We’re always happy to help!